Established for over 20 years Kubex is recognised as a leader in the design and manufacture of bathroom products. A family owned and run company; Kubex continues to deliver stylish and practical solutions that are affordable without compromise. Manufacturing in the UK ensures that Kubex products are of the highest quality and can be delivered ready for installation within days. 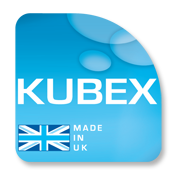 Kubex products are available nationally through your local Plumbers merchant, Bathroom showroom or Mobility outlet. Having developed excellent relationships with thousands of National and Independent retailers we have ensured that purchasing your chosen Kubex product can be done with ease.